Image from 1915 Suffolk Chronicle & Mercury Newspaper. Died: 13th August 1915; Died at Sea. Drowned Dardanelles, Aegean Sea, aboard ‘Royal Edward’, following torpedo attack by enemy submarine. Served 186 days. Residence: 328, Spring Road, Ipswich. Enlistment Details: Location: Ipswich; Date: 9th February 1915; age 25 years; Address: 634, Woodbridge Road, Ipswich. Signed up for the Duration of the War. Height: 5ft 8ins. 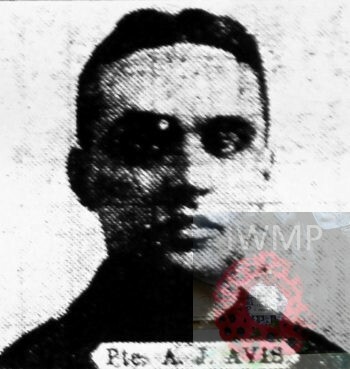 Next of Kin: father – Arthur Avis, of 94, Far Gosford Street, Coventry, Warwickshire. Embarked: Devonport – 30th July 1915 – Alexandria – 11th August 1915. Rank: Private; Service Number: 92. Regiment: Royal Army Medical Corps, East Anglian Clearing Station. Relatives Notified & Address: Son of Arthur & Alice Jane Avis, of 94, Far Gosford Street, Coventry; husband of Lilian Elizabeth Avis, of 328, Spring Road, Ipswich. 1891 6, King’s Road, Lakenham, Norfolk. Arthur was a year old and living with his parents. Arthur Avis, 25, a Bricklayer, born Norwich, Norfolk. Alice Jane Avis (nee Miller), born Mildenhall, Suffolk. 1901 34, Spring Road, Ipswich. Arthur was 11 years old and living with his parents & sister + maternal uncle. Arthur, 35, a Builder – own account. Alice Miller Avis, 8, born Ipswich. Ernest W. Miller, 21, a Carpenter, born Norwich. 1911 634, Woodbridge Road, Ipswich. Arthur was 21 years old, a Clerk to County Education Committee. He was a boarder at the home of Charles William Pryor. Arthur attended the Boy’s Secondary School, Ipswich. Upon leaving he joined the clerical staff of the East Suffolk Education Committee. When the office of Medical Officer of Health for East Suffolk was being re-organised Arthur was transferred to that department as chief clerk, a position he held until he enlisted. His knowledge of sanitary and medical matters made him a desirable member of the Casualty Clearing Station. In 1915, Ipswich, shortly before leaving for active service, Arthur married Lilian Elizabeth Bucall, born 1891, Ipswich. Probate to Lilian Elizabeth Avis – widow. Soldiers’ Effects to Lilian Elizabeth Avis – widow. The Royal Army Medical Corps (RAMC) is part of the British Army providing medical services to all British Army personnel and their families in war and in peace. Together with the Royal Army Veterinary Corps, the Royal Army Dental Corps and Queen Alexandra’s Royal Army Nursing Corps, the RAMC forms the British Army’s essential Army Medical Services. In combat the men followed the troops over the top into no man’s land suffering losses of 743 officers and 6130 soldiers killed, while delivering medical care to wounded exposed to enemy fire. A non-combatant roll under the Geneva Convention ,members of the RAMC may only use weapons for self-defence.